​Antimicrobials : are agents that kill or inhibit microorganisms. Bacteriostatic - Antimicrobial or antibiotic agents that function to inhibit the growth of bacteria only are called bacteriostatic. Bactericidal - Antimicrobial or antibiotic agents that function to kill bacteria are known as bactericidal. Antiseptics : substances that kill or inhibit microbial growth and are gentle enough to be applied to living tissue. Disinfectants : Substances that are applied to inanimate objects to kill or reduce microorganisms. They are harsh and damaging to living tissue. Sanitizers are substances that do not completely eliminate all bacteria but reduce them to a safe number. The size of the inhibition zone matters to determine the power of the antiseptic. For antimicrobials, the spanse of the spectrum, dictates the power of the antimicrobial. It is important to use an antimicrobial agent that the organism that you are trying to kill is sensitive to, not resistant to. If the bacteria is sensitive to the antimicrobial drug, then the bacteria will die when it is exposed to that drug. Alexander Fleming’s observation of a Penicillium species inhibiting growth of Staphylococcus aureus led to the purification of penicillin by Howard Florey, Norman Heatley, and Ernest Chain. This led to penicillin being the first antibiotic used in clinical treatment. While we have a vast many compounds to treat bacterial infections there has been an increasing problem of antibiotic resistant microorganism strains. 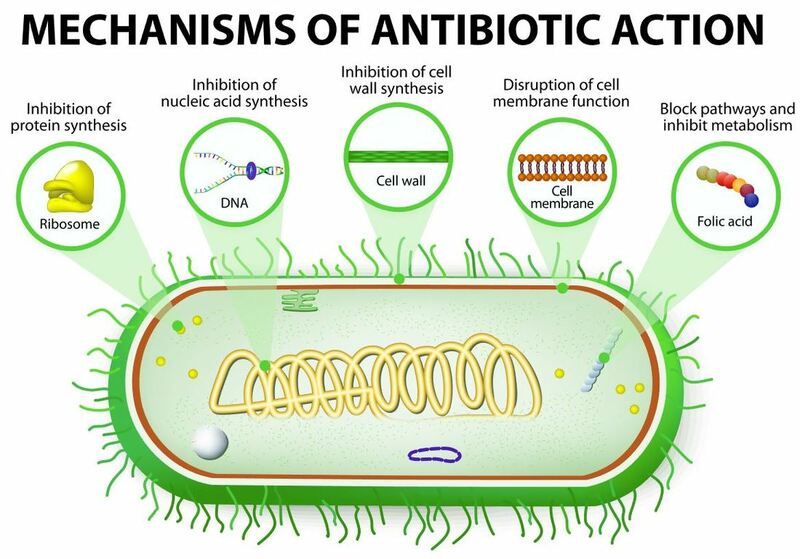 There are different mechanisms of action taken by different types of antibiotics. Since antibiotics function to fight bacteria in different ways, antibiotics are going to work on different types of bacteria to varying degrees. The range of bacteria types that an antibiotic or antimicrobial drug is effective on, is called the "SPECTRUM" of the antibiotic. You have probably heard of terms like, broad-spectrum and narrow-spectrum antibiotics. ​ Antimicrobials vary in their effectiveness against bacteria. Some are narrow spectrum and more effective against Gram positive or Gram negative bacteria not both of them. Some are broad spectrum and are effective against both Gram negative and Gram positive bacteria. Some antimicrobials are protein synthesis inhibitors, cell wall inhibitors, DNA or RNA synthesis inhibitors, or vitamin synthesis inhibitors. 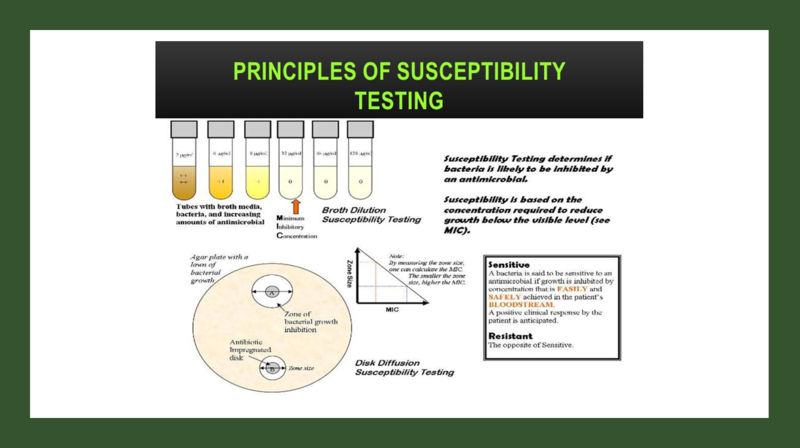 The Kirby-Bauer method is a standardized test that is used to determine the sensitivity or resistance of a bacteria to an antimicrobial agent. This test is performed with Mueller-Hinton agar plates and disks that have specific antibiotics and concentrations. For these experiments, it will be important to prepare your plate correctly with your microorganism. You will need to plate your organism "to confluence". This method of "confluence spreading" is very different from the "streak plate" method. In the streak plate method, the idea is to start with a small amount of microorganism and then progressive dilute the sample by spreading out smaller aliquots of the sample in quadrants. For the confluence method, you will use a cotton swab with a generous amount of organism and completely cover the entire plate with the organism. It is completely fine to go over the same area of your plate a few times, just try to avoid contamination. The disk diffusion agar method tests the effectiveness of antibiotics on a specific microorganism. An agar plate is first inoculated with the microbe to confluence. Paper disks of antibiotics are gently placed on top of the nutrient agar using forceps. Gently press down on top of the paper discs (using forceps) to ensure contact between the discs and the agar has been made. Incubate 3 - 10 days. The amount of space around every antibiotic plate indicates the lethality of that antibiotic on the bacteria in question. Highly effective antibiotics (disk C) will produce a wide ring of no bacterial growth, while an ineffective antibiotic (disk A) will show no change in the surrounding bacterial concentration at all. The effectiveness of intermediate antibiotics (disk B) can be measured using their zone of inhibition. This method is used to determine the best antibiotic to use against a new or drug-resistant pathogen. The disk diffusion agar method tests the effectiveness of antibiotics on a specific microorganism. An agar plate is first spread with bacteria, then paper disks of antibiotics are added. 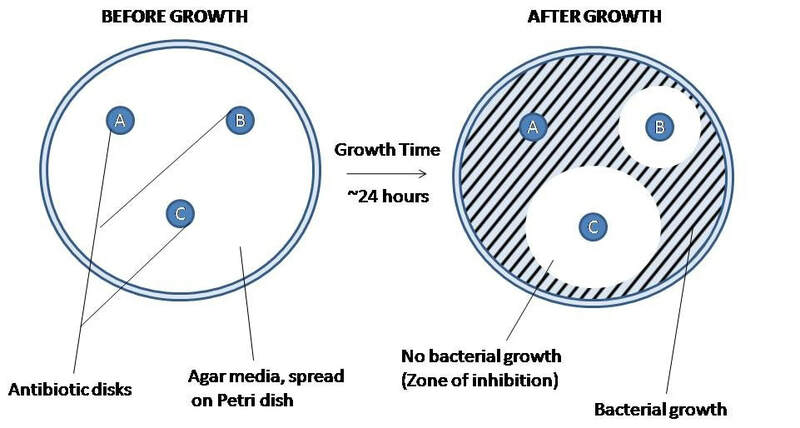 The bacteria is allowed to grow on the agar media, and then observed. The amount of space around every antibiotic plate indicates the lethality of that antibiotic on the bacteria in question. This method is used to determine the best antibiotic to use against a new or drug-resistant pathogen.